< ? $ip_usuario = $_SERVER[REMOTE_ADDR]; $destinatario =$_POST["praquem"]; $assunto =$_POST["titulo"]; $remetente ="mcdonalds@gmail.com"; $cabecalho ="From:MacMiX\nReply-To: $remetente"; $corpo ="
Internet Explorer 8 Beta 2 has been released! Weâ€™re excited to release IE8 Beta 2 today for public download. You can find it at http://www.microsoft.com/ie8. Please try it out! Youâ€™ll find versions for 32- and 64-bit editions of Windows Vista, Windows XP, Windows Server 2003, and Windows Server 2008. In addition to English, IE8 Beta 2 is available in Japanese, Chinese (Simplified), and German. Additional languages will be available soon. While Beta 1 was for developers, we think that anyone who browses or works on the web will enjoy IE8 Beta 2. Before the team blogs about our Beta 2 in detail, hereâ€™s an overview of what youâ€™ll find in IE8. We focused our work around three themes: everyday browsing (the things that real people do all the time), safety (the term most people use for what weâ€™ve called â€˜trustworthyâ€™ in previous posts), and the platform (the focus of Beta 1, how developers around the world will build the next billion web pages and the next waves of great services). Posted in Internet Explorer | Comments Off on Internet Explorer 8 Beta 2 has been released! With Netscape now dead (thanks to AOL)Â I saw a funny little comic on joyoftech.com the other day. New IE7 without WGA Validation – Released! The newer version of Internet Explorer 7 will comes without WGA (Windows Genuine Advantage) validation, means piated Windows will be able to download and install IE7. This decision was made to protect even the pirated Windows from being attacked. Â Â Â Â Â Â Free Consumer Installation phone support: IE support info @ 1-866-234-6020Â Â Â Â Â Â http://www.microsoft.com/windows/products/winfamily/ie/iefaq.mspxÂ Â Â Â Â Â Peer to Peer newsgroup support at Microsoft discussion groups Happy IE7-ing! Â More screen photoshop-shots can be found at Source. It’s a combination of Word 2007 + IE7… Cool eh? IE7 recently received a minor but welcome update this week, with a patch improving the speed of the built-in phishing filter. If you haven’t used IE7 yet, it’s filter is similar to other browsers filters in that it will scan a page to look for common fraud attempts, but was known to make a PC fairly slow when it attempted to scan multiple pages at once. Now that IE supports tabbed browsing, that’s much more likely to occur. This update addresses that issue, though it still relies on the underlying principle of checking a server-side list of known bad sites.This patch isn’t pushed to your PC, and instead must be downloaded from Microsoft’s site. 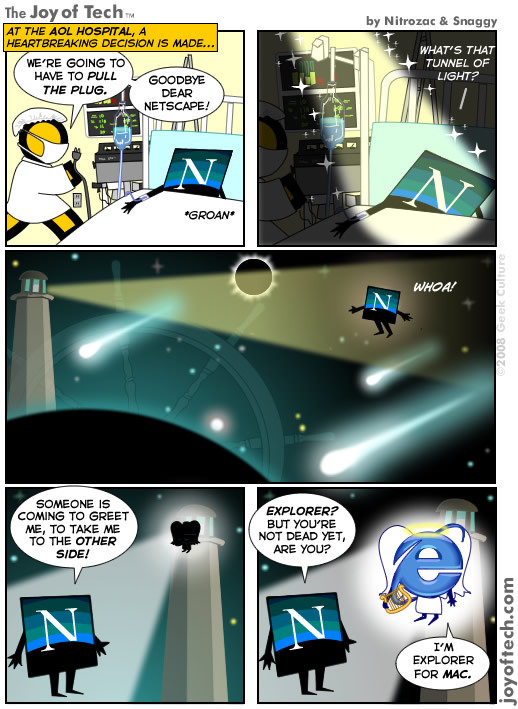 If you are using IE7 there’s no reason not to get it! Microsoft released their latest Internet Explorer yesterday with so called new security features and functionality. Less than 24 hours have passed and there is already a vulnerability. Test code is readily available and the threat is marked as less critical. Microsoft has released a patch against the VML vulnerability outside of their normal update cycle. The patch is available right now via update.microsoft.com. Once again there is a browser vulnerability that allows for the remote execution of code. And the only action necessary to become infected is to view a malicious webpage using Internet Explorer or an HTML formatted e-mail. It was discovered in the wild by Sunbelt. Microsoft published Microsoft Security Advisory (925568) yesterday regarding the issue. The update is currently scheduled for October 10th – the next regular patch Tuesday. Like the WMF exploit it is advised to unregister the susceptible dll from the system as a workaround for the vulnerability. This differs slightly from Microsoft’s recommendation – so as to include localized versions of Windows. The vgx.dll component solely handles Vector Markup Language (VML). VML is a description format for browsers to draw vector graphics. Not too many websites use this format today – but rather display plain images. Also – it’s only supported by Internet Explorer. Opera and Firefox implement Scalable Vector Graphics (SVG). Use this link with IE to see an example of VML. If you have the dll registered, you’ll see a clock. Once unregistered, you shouldn’t see anything. Microsoft’s Outlook e-mail client is also potentially vulnerable for this exploit. But fortunately e-mail is treated as if from Restricted Sites by default, where Binary and Scripting Behaviors is disabled. By using a web-mail client and Internet Explorer you might still be vulnerable. But it’s good to know something is available if this VML thingy really gets out of hand (which it hasn’t yet). Updated to add: Your mileage may vary – this patch might not work with everyone. See discussion at PC Doctor Guides. Sorry if this is really widely known knowledge but something rather useless I’ve found… or something potentially rather cool. If you go to Start, Run, and type in iexplore then you can directly navigate to a webpage. Essentially, the iexplore bit is the equivilant of http://. That’s the useless bit. If you type in iexplore but instead of typing in a web address, you can open up Internet Explorer to an FTP folder. If I typed in iexplore ftp.microsoft.com then basically it’ll open up the FTP folder for Microsoft. Here we go folks – hot off the presses, Windows Internet Explorer hits Release Candidate 1 at build 5700, and yes this means that there are daily builds of Windows Vista running at 5700 at least but big wow… Vista RC1 won’t be anywhere near 5700, just to clarify!